Pest description and crop damage The black bean aphid is a dark-bodied aphid, 0.0625 inch long, that sporadically reaches damaging levels, most often late in the season. Infestations usually occur as scattered hot spots or along edges rather than uniformly across the entire field. Colonies can produce massive amounts of honeydew, which causes a black, sooty mold to cover the leaves. Black bean aphids can also vector virus diseases, but they are less important as virus vectors than green peach aphids. The green peach aphid is yellowish green and teardrop-shaped. Its economic impact is primarily as a vector of virus diseases rather than by feeding injury through sucking sap. Scouting and thresholds No formal economic thresholds exist for green peach aphid insecticide treatment decisions. 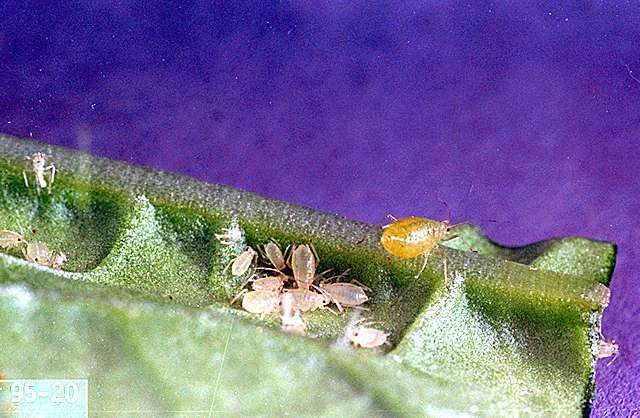 If natural enemies are absent, consider an insecticide application if bean aphids are on most leaves and if colonies cover 20 to 40 percent of leaf surface. 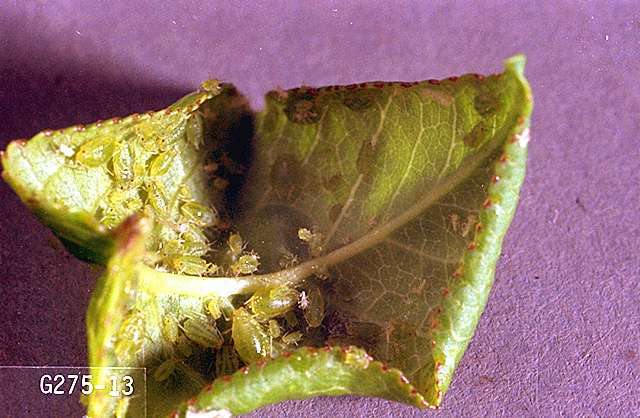 Aphids are attacked by a large variety of predatory and parasitic insects as well as by fungal diseases. We do not yet know enough about arthropod natural enemies to suggest practical ways of manipulating and enhancing their effects other than avoiding any unnecessary insecticide applications. Beauveria bassiana (BotaniGard 22WP, BotaniGard ES, Mycotrol ESO, Mycotrol O, Mycotrol WPO, and others - live spores of an insect-killing fungus)-See label for rates. PHI 0 days. Typically requires 7 to 10 days after first spray for signs of effectiveness. Begin treatment at first appearance of pest. Reapply as necessary. OMRI-listed for organic use. Chromobacterium subtsugae (Grandevo, Grandevo PTO, Grandevo WDG - insect-killing bacterium) at 0.6 to 0.9 lb ai/a. REI 4 hr. Must be mixed with water and applied as a foliar spray with ground or aerial equipment for conventional spraying or by chemigation. OMRI-listed for organic use. aldicarb (AgLogic 15G, AgLogic 15GG) at 1.05 to 2.1 lb ai/a. PHI 90 days, or 120 days if tops are fed to livestock. Do not use tops as food for humans. Do not make more than one at-planting and two postemergence applications per crop. Do not exceed a total of 4.95 lb ai/a per season. Immediately deep-disk any spills at row ends or elsewhere to ensure the granules are covered with a layer of soil. At planting (or within 1 week before planting)-Drill granules 1 to 3 inches below seedline. Granules can be placed into the seed furrow if rate does not exceed 1.05 lb ai/a. Repeat applications may be required for continued protection against aphids vectoring viruses. Postemergence-Granules may be applied to both sides of plant row and immediately worked into the soil or covered with soil. Furrow irrigation is another method: side-dress granules 4 to 8 inches to water-furrow side of plant row and at furrow depth. Irrigate soon after application. Apply within 60 days of planting. 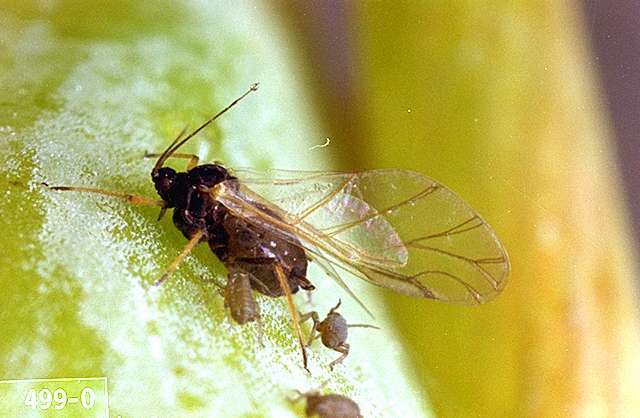 Repeat applications may be required for continued protection against aphids vectoring viruses. Do not apply postemergence if 4.05 to 4.95 lb ai/a was applied at time of planting or 1 week prior to planting. (Azatin XL) at 0.021 to 0.033 lb ai/a. For suppression only. (Aza-Direct) at 0.0123 to 0.024 lb ai/a and up to 0.0432 lb ai/a under extremely heavy infestation. azadirachtin/pyrethrins (Azera) at 0.0125 to 0.025 lb ai/a, and up to 0.044 lb ai/a under extremely heavy infestation. Dilute in a minimum of 30 gal of water per acre. May be applied by air at 0.0125 to 0.025 lb ai/a in a minimum of 25 gal of water. Do not repeat more than every 5 to 7 days. OMRI-listed for organic use. chlorpyrifos (Drexel Chlorpyrifos 4E AG, Govern 4E, Lorsban 4E, Warhawk, and others) at 0.5 to 1 lb ai/a broadcast -or- Lorsban Advanced, Vulcan at 0.469 to 0.939 lb ai/a broadcast. PHI 30 days. Do not allow livestock to graze in treated areas or harvest treated beet tops as feed for meat or dairy animals within 30 days after last treatment. FIFRA Section 2(ee) recommendation. chlorpyrifos (Govern 4E, Lorsban 4E, Warhawk, and others) at 0.33 to 0.67 lb ai/a -or- Lorsban Advanced at 0.313 to 0.626 lb ai/a. Apply as a 5- to 7-inch band, lightly incorporating mechanically or with irrigation. FIFRA Section 2(ee) recommendation. clothianidin (NipsIt INSIDE)-For black bean aphid. Application only by commercial seed treaters; no on-farm seed-treatment application. clothianidin/Bacillus firmus I-1582 (Poncho/Votivo)-Application only by commercial seed treaters; no on-farm seed-treatment application. methomyl (Annihilate LV, Annihilate SP, Corrida 29 SL, Corrida 90 WSP, Lannate LV, Lannate SP, M1 LV, M1 SP, Nudrin LV, Nudrin SP) at 0.225 to 0.9 lb ai/a. PHI for roots 21 days or 30 days if tops are fed to livestock. REI 48 hr. Do not apply more than 4.5 lb ai/a per crop. Do not apply more than 10 times per crop. May be applied by overhead sprinkler chemigation to control aphids, in which case highest listed rate should be used with 0.1 to 0.2 inches of water per acre. naled (Dibrom 8 Emulsive) at 0.94 lb ai/a. REI 48 hr. PHI 2 days. Recommendation as permitted under FIFRA Section 2(ee). Do not apply more than 4.7 lb ai/a per season. Do not apply more than five times per season. oxydemeton methyl (MSR Spray Concentrate) at 0.45 to 0.6 lb ai/a. Do not apply more than once per season. Do not harvest beets or use beet tops for feed or forage within 30 days of last application. At planting-Apply at 0.68 to 0.9 oz ai/1,000 row feet. PHI 30 days. Do not feed tops or silage to dairy cattle. Do not place granules in direct contact with seed. Drill to side of seed or band over seed. Only one application per cropping season. Postemergence-Apply at 0.98 to 1.5 lb ai/a. Apply to foliage when plants are dry. Only one postemergence treatment per season. PHI 30 days. potassium salts of fatty acids (Des-X, Kopa, and M-Pede)-See label for rates. For green peach aphid, apply M-Pede only in tank mix with labeled companion insecticide; see label about tank mixing. PHI 0 days. Some formulations are OMRI-listed for organic use. potassium silicate (Sil-Matrix) at 1.5 to 3 lb ai/a-For suppression only. Do not apply more than 21 lb ai/a per seaon. PHI 0 days. OMRI-listed for organic use. pyrethrins/Beauveria bassiana (BotaniGard Maxx, and Xpectro OD)-See label for rates. Do not reapply for at least 3 days. In case of extreme pest pressure, wait a minimum of 24 hr before reapplying. Do not harvest until spray has dried. sodium tetraborohydrate decahydrate (Prev-Am Ultra) applied as a 0.8% solution, 40 to 50 gal per acre. Spray every 7 to 10 days as necessary. spirotetramat (Movento and Movento HL) at 0.07 to 0.14 lb ai/a. For black bean aphid control only. PHI 28 days. Maximum 0.28 lb ai/a per crop season. sulfoxaflor (Transform WG) at 0.023 to 0.047 lb ai/a. Do not apply more than 0.266 lb ai/a per year. PHI 7 days. terbufos (Counter CR Lock'n Load, Counter 20G Lock'n Load, Counter Smartbox 20G, Counter 15G Lock'n Load, Counter 15G Smartbox)-One application per year. Do not place granules in direct contact with the seed. Do not exceed 2 lb ai/a. PHI 110 days for at planting banded, at planting in-furrow, or postemergence applications; PHI 150 days for at planting knifed-in application. At planting (several methods)-Apply at 0.6 to 1.2 oz ai/1,000 row feet, in 5- to 7-inch band over the row, and lightly incorporate. Apply at 1.2 oz ai/1,000 row feet, modified in-furrow, 2 to 3 inches behind seed drop zone (after some soil has covered the seed). Apply at 1.2 oz ai/1,000 row feet, knifed-in: drill granules 2 inches to the side of the seed and 2 to 4 inches below the seed. Postemergence-Apply at 0.6 to 1.2 oz ai/1,000 row feet, in 5- to 7-inch band over the row, and lightly incorporate. (Mustang) at 0.028 to 0.05 lb ai/a. Variable control depending on aphid species. PHI 50 days. Do not apply more than 0.15 lb ai/a per season (at planting/foliar applications). Apply with ground or air equipment using enough water to fully cover foliage. (Mustang Maxx) at 0.014 to 0.025 lb ai/a. 50 day PHI for tops or roots. Do not apply more than 0.075 lb ai/a per season. REI 12 hr. Apply by air or ground using minimum of 2 gal per acre by air and 10 gal per acre by ground. 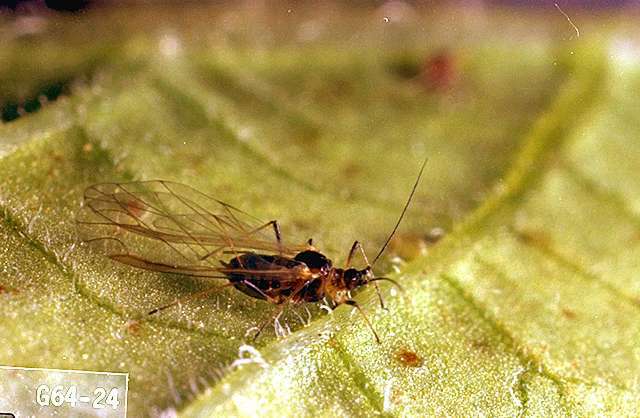 Aphid control may be variable depending on species present and host-plant relationships.